There are so many different student loan forgiveness programs available it can be hard to know where to start. And for many, it really depends on your situation and what your financial (and career) goals are. The goal of this guide is to combine as many of the different ways to find student loan forgiveness (and repayment assistance) into one spot to make it easy for you to get help for your student loan debt. Alight, let's dive into all the different ways to get student loan forgiveness. These student loan forgiveness plans are tied to your student loan repayment plan. If you're on one of these qualifying repayment plans, you'll be eligible for student loan forgiveness at the end of your repayment term. It's important to note that these income-driven repayment plan options due have some criteria that must be met to be eligible. If you have no remaining balance at the end of the loan term, you get no student loan forgiveness. It's also important to note that the student loan forgiveness on these plans is considered taxable income. Learn more about taxes and student loan forgiveness here. You can apply for these repayment plans with student loan forgiveness by calling your lender or going online to StudentLoans.gov. The Income Based Repayment Plan (IBR) is one of the most common repayment plans borrowers switch to if they are having financial hardship. If you have loans from before July 1, 2014, you payment will not be higher than 15% of your discretionary income. On this plan, you will make payments for 25 years, and at that point, your loans will be forgiven. If you are a borrower with loans after July 1, 2014, your loan will not exceed 10% of your discretionary income, and the loan will be forgiven after just 20 years. The Pay As You Earn Repayment Plan (PAYE) is very similar to the IBR Plan. With PAYE, you will not pay more than 10% of your discretionary income, and your loan will also be forgiven after 20 years. The key difference is that only certain loans going back to 2007 qualify for this plan. RePAYE is a modified version of PAYE that has become available to borrowers after December 17, 2015. Unlike PAYE, which was available for loans taken out after 2007, RePAYE is open to all Direct Loan Borrowers, regardless of when the loan was taken out. The repayment plan still caps your payment at 10% of your discretionary income, and the loan will be forgiven after 20 years. You can learn more about RePAYE and the interest subsidy here. With the ICR plan, your loans will be forgiven at the end of 25 years. Depending on what type of career path you choose, you could qualify for various different student loan forgiveness options. The most popular option is Public Service Loan Forgiveness. The reason is that this plan offers the biggest amount of forgiveness in the shortest period of time - tax free. It's also open to a lot of different jobs under the umbrella of "public service". However, it's not the only career-based option. Public Service Loan Forgiveness Program will grant student loan forgiveness on qualifying loans after 120 payments (10 years). The great thing about public service is that the definition is very broad. Qualifying employment is any employment with a federal, state, or local government agency, entity, or organization or a not-for-profit organization that has been designated as tax-exempt by the Internal Revenue Service (IRS) under Section 501(c)(3) of the Internal Revenue Code (IRC). The type or nature of employment with the organization does not matter for PSLF purposes. If you want step-by-step help filing for Public Service Loan Forgiveness, check out our short 15 minute course below: PSLF Training Program. Or, check out our guide: The Ultimate Guide To Public Service Loan Forgiveness (PSLF). This program is for attorneys who work for the U.S. Department of Justice. The Department anticipates selecting new attorneys each year for participation on a competitive basis and renewing current beneficiaries during existing service obligations, subject to availability of funds. ASLRP benefits are paid directly to the loan holder, not to the individual attorney. Initial acceptance of ASLRP funding triggers a three-year service obligation to Justice. You can learn more about this program here. The Faculty Loan Repayment Program from the Health Resource and Services Administration (HRSA) helps recruit and retain health professions faculty members by encouraging students to pursue faculty roles in their respective health care fields. This is vital for preparing and supporting the next generation of educators. You can receive up to $40,000 in student loan repayment, along with extra money to help offset the tax burden of the program. 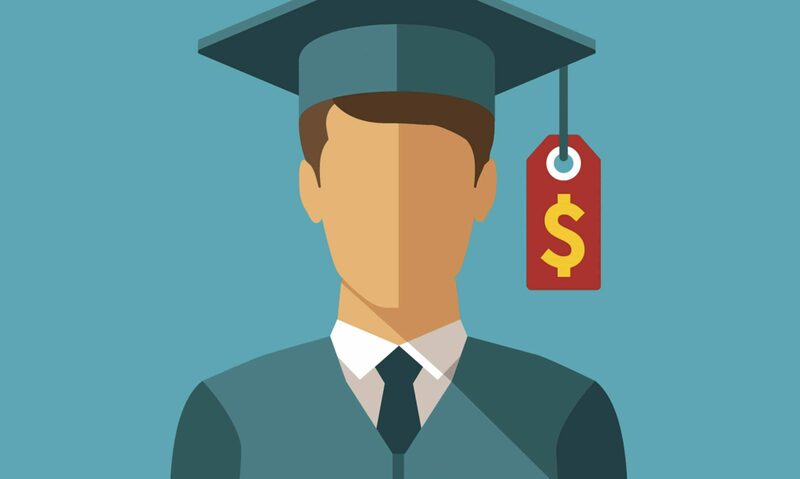 The Federal student loan repayment program permits agencies to repay Federally insured student loans as a recruitment or retention incentive for candidates or current employees of the agency. This plan allows Federal agencies to make payments to the loan holder of up to a maximum of $10,000 for an employee in a calendar year and a total of not more than $60,000 for any one employee. It's important to note that an employee receiving this benefit must sign a service agreement to remain in the service of the paying agency for a period of at least 3 years. An employee must reimburse the paying agency for all benefits received if he or she is separated voluntarily or separated involuntarily for misconduct, unacceptable performance, or a negative suitability determination under 5 CFR part 731. In addition, an employee must maintain an acceptable level of performance in order to continue to receive repayment benefits. Furthermore, you must sign up for this program when you're hired. You can't go back to your HR department after you're already employed and ask for it. The Indian Health Service (IHS) Loan Repayment Program awards up to $20,000 per year for the repayment of your qualified student loans in exchange for an initial two-year service obligation to practice full time at an Indian health program site. The John R. Justice Student Loan Repayment Program (JRJ) provides loan repayment assistance for state public defenders and state prosecutors who agree to remain employed as public defenders and prosecutors for at least three years. This program provides repayment benefits up to $10,000 in any calendar year or an aggregate total of $60,000 per attorney. The National Health Service Corps (NHSC) offers tax-free loan repayment assistance to support qualified health care providers who choose to take their skills where they’re most needed. Licensed health care providers may earn up to $50,000 toward student loans in exchange for a two-year commitment at an NHSC-approved site through the NHSC Loan Repayment Program (NHSC LRP). Accepted participants may serve as primary care medical, dental, or mental/behavioral health clinicians and can choose to serve longer for additional loan repayment support. Priority consideration is given to eligible applicants whose NHSC-approved site has a HPSA score of 26 to 14, in descending order. Eligible applicants may receive up to $50,000 in loan repayment for an initial service commitment until funding is exhausted. In return for loan repayments, LRP awardees are legally bound to a service obligation to conduct qualifying research supported by a domestic nonprofit or U.S. government (Federal, state, or local) entity for 50 percent of their time (at least 20 hours per week based on a 40-hour week) for two years. NIH makes quarterly loan repayments concurrent with the awardees’ satisfaction of their service obligation. Payment projections are based on eligible educational debt at the start date of the LRP contract. The NIH will repay 25 percent of the eligible education debt, up to a maximum of $35,000 per year. The Nurse Corps Repayment Program supports registered nurses (RNs), advanced practice registered nurses (APRNs), and nurse faculty by paying up to 85% of their unpaid nursing education debt. You must work at an eligible Critical Shortage Facility in a high need area (for RNs, APNs), and have attended an accredited school of nursing (for nurse faculty). You must also fulfill two years of work in this area. This is a scholarship and loan forgiveness program that rewards individuals who start a career in the automotive industry. You must work for an employer that is part of the Specialty Equipment MarketAssociation (SEMA). Check out some other options for student loan forgiveness for engineering majors. This program will pay $2,000 toward outstanding student loans, mailed directly to your lender. Under the Teacher Loan Forgiveness Program, if you teach full-time for five complete and consecutive academic years in a low-income school or educational service agency, and meet other qualifications, you may be eligible for forgiveness of up to $17,500. There are a lot of nuances and options in this program, and we break down all the details here: Student Loan Forgiveness for Teachers. It's also important to note how PSLF and Teacher Loan Forgiveness play together, and why PSLF is probably the better choice for most. You can learn about this program here. This is a program for those who practice veterinary medicine. This program will pay up to $25,000 each year towards qualified educational loans of eligible veterinarians who agree to serve in a NIFA-designated veterinarian shortage situation for a period of three years. You can find out the timing and learn more information about this program here. Serving our country can be a great career. And there are good incentives to sign up and serve. Student loan forgiveness has been one of these programs. If you're considering a career in the military, find out if they will help pay down or eliminate your student loan debt. The main Air Force College Loan Repayment program is paused in 2018 (sadly). This program allowed you to get up to $10,000 in student loan debt paid off in 3 years. However, the Air Force JAG student loan repayment program is still active. You can receive up to $65,000 in student loan forgiveness if you go into JAG in the Air Force. The Army College Loan Repayment program is the most generous of all the branches, but it does have some big "catches" that you need to be aware of. First, this program will forgive up to $65,000 of your student loan debt for highly qualified individuals who enlist in one of the Army’s critical military occupational specialties (MOS). However, to qualify, you must have this written into your enlistment contract, AND you must give up your Post 9/11 GI Bill. So, if you're thinking about going back to college, this might not be a good deal. The National Guard Student Loan Repayment program offers loan forgiveness up to $50,000 for qualifying Federal loans for guardsmen who enlist for at least 6 years. There are also other terms and conditions that must be met for this program. The Navy Student Loan Repayment Program is one of several Navy enlistment education incentive programs designed to pay federally guaranteed student loans (up to $65,000) through three annual payments during a Sailor's first three years of service. You must sign up for this program when you enlist, and your recruiter must include this program in your recruiting paperwork. The Army maintains student loan forgiveness programs for individuals who practice medicine or dentistry while in service. On top of bonuses in pay, they student loan repayment of up to $120,000, paid in $40,000 installments over 3 years. The Navy also offers student loan repayment assistance for individuals who practice medicine while in service. You can receive up to $40,000 per year in student loan repayment benefits. Almost every state in the United States offers some type of student loan forgiveness or student loan repayment assistance option for their residents. Some states have quite a few programs that you could take advantage of. Alabama - Alabama is one of the few states that doesn't have a student loan forgiveness program. Alaska - Alaska currently has one program. Arizona - Arizona currently has three programs. Arkansas - Arkansas currently has two programs. California - California currently has three forgiveness programs. Colorado - Colorado currently has three forgiveness programs. Connecticut - Connecticut is one of the few states that doesn't have a student loan forgiveness program. Delaware - Delaware currently has one student loan forgiveness program. Florida - Florida currently has two student loan forgiveness programs. Georgia - Georgia currently has one student loan forgiveness program. Hawaii - Hawaii currently has one student loan forgiveness program. Idaho - Idaho currently has one student loan forgiveness program. Illinois - Illinois currently has four student loan forgiveness programs. Indiana - Indiana currently has one student loan forgiveness program. Iowa - Iowa currently has six student loan forgiveness programs. Kansas - Kansas currently has three student loan forgiveness programs. Kentucky - Kentucky currently has one student loan forgiveness program. Louisiana - Louisiana currently has three student loan forgiveness programs. Maine - Maine currently has five student loan forgiveness programs. Maryland - Maryland currently has three student loan forgiveness programs. Massachusetts - Massachusetts currently has one student loan forgiveness program. Michigan - Michigan currently has two student loan forgiveness programs. Minnesota - Minnesota currently has ten student loan forgiveness programs. Mississippi - Mississippi currently has one student loan forgiveness program. Missouri - Missouri currently has three student loan forgiveness programs. Montana - Montana currently has three student loan forgiveness programs. Nebraska - Nebraska currently has one student loan forgiveness program. Nevada - Nevada currently has one student loan forgiveness program. New Hampshire - New Hampshire currently has two student loan forgiveness programs. New Jersey - New Jersey currently has three student loan forgiveness programs. New Mexico - New Mexico currently has three student loan forgiveness programs. New York - New York currently has nine student loan forgiveness programs. North Carolina - North Carolina currently has three student loan forgiveness programs. North Dakota - North Dakota currently has three student loan forgiveness programs. Ohio - Ohio currently has two student loan forgiveness programs. Oklahoma - Oklahoma currently has three student loan forgiveness programs. Oregon - Oregon currently has three student loan forgiveness programs. Pennsylvania - Pennsylvania currently has two student loan forgiveness programs. Rhode Island - Rhode Island currently has three student loan forgiveness programs. South Carolina - South Carolina currently has one student loan forgiveness program. South Dakota - South Dakota currently has one student loan forgiveness program. Tennessee - Tennessee is one of the few states with no programs. Texas - Texas currently has nine student loan forgiveness programs. Utah - Utah is one of the few states with no student loan forgiveness programs. Vermont - Vermont currently has five student loan forgiveness programs. Virginia - Virginia currently has three student loan forgiveness programs. Washington - Washington currently has one student loan forgiveness program. West Virginia - West Virginia is one of the few states with no student loan forgiveness programs. Wisconsin - Wisconsin currently has one student loan forgiveness program. Wyoming - Wyoming currently has two student loan forgiveness programs. The District of Columbia - Washington D.C. currently has two student loan forgiveness programs. Some employers are now offering student loan repayment assistance to their employees as an employee benefit. We try to keep track of the full list of employers that offer this benefit, and as of this publication we know of at least 17 employers offering student loan repayment assistance in the United States. These include some major companies, such as Fidelity, Aetna, Nvidia, and more. You can find the full list of employers offering student loan repayment assistance here. Believe it or not, there are options to get student loan forgiveness for volunteering! Now, this isn't the same as volunteering at your local church or food bank. This does require some serious volunteering that's pretty much equivalent to full-time work. If you volunteer with AmeriCorps NCCC, AmeriCorps State and National, or AmeriCorps VISTA and complete a 12-month term, you could be eligible to receive assistance up to the value of a Pell Grant - which is currently $5,920. There are benefits available to people who complete full time service all the way down to affiliate service (just 100 hours). This is a really interesting program that allows donors to sponsor an organization, which in turn, if you volunteer at, can receive student loan repayment assistance. You must have graduated from college with student loan debt. This program allows borrowers to volunteer at participating nonprofits in need of manpower and, in return, have their student loan debt paid down by sponsors who have also signed up with SponsorChange.org. You can learn more about this opportunity here. There are also ways to get your student loans discharged in some circumstances. We consider student loan discharged to be a little bit different than forgiveness, both due to the nature of the way the loan is eliminated and the potential taxability surrounding it. There are various discharge options you may qualify for. This program is for borrowers who could not complete their program of study because the school closed while they were enrolled or within 120 days of their attendance. However, to be eligible, it also means that you were not able to transfer your credits to another eligible institution. If you think this may apply to you, find the appropriate contact here. If you have loans taken out in your name that weren't yours - due to identity theft or other false certification (this means someone forged your signature or information on a student loan), you are eligible to have your student loans discharged. There are a lot of steps you need to take if your identity was stolen and student loans were taken out. You should also file a police report. Check out our full guide to identity theft and student loans. You can find the false certification discharge application here. If you have Federal student loans, they are discharged upon death of the borrower. Even for Parent PLUS Loans, if the student dies, the loans will still be discharged. That doesn't mean there aren't complications - that could be costly. Read this guide to what happens to your student loans when you die. If you have private student loans, the cosigner is still likely 100% responsible for the balance of the loan. It's one of the reasons why we recommend private loan cosigners get a life insurance policy on the borrower. You can learn more about student loan discharge due to death here. If you become totally and permanently disabled, you may be eligible to have your student loans discharged. To qualify, a physician must certify that the borrower is unable to engage in substantial gainful activity due to a physical or mental impairment. This impairment must be expected to result in death or last for a continuous period of at least 60 months, or it must have already lasted for a continuous period of at least 60 months. Any remaining balance on your Federal student loans will be discharged from the date that your physician certifies your application. The Secretary of Veteran Affairs (VA) can also certify the borrower to be unemployable due to a service-connected disability. If the VA certified your application, any Federal student loan amounts owed after the date of the service-related injury will be discharged, and any payments you made after your injury would be refunded to you. Borrowers may also be eligible for discharge if they have been certified as disabled by the Social Security Administration (SSA) where the notice of award for Social Security Disability Insurance (SSDI) or Supplemental Security Income (SSI) benefits indicates that the borrower’s next scheduled disability review will be within 5 to 7 years. If you were approved due to the SSA determination, any remaining balance on your Federal student loans would be discharged. You can learn more about Disability Discharge here. Many people falsely believe that student loans cannot be discharged in bankruptcy. The fact is, borrowers may be eligible to have their student loans discharged in bankruptcy - but it's rare. You will have to prove to the judge that repaying your loans would be an undue hardship. This standard requires you to show that there is no likelihood of any future ability to repay. This key fact - future ability - is hard because the future is a long time. Let's say you're 35 years old. Can you really say that over the next 50 years you'll never earn enough to repay the loans? It's a tough standard. As a result, it can be difficult to discharge Federal student loans through bankruptcy—but not impossible. Furthermore, many lawyers (and even some judges) are not aware of how to handle student loans and bankruptcy. You should ensure that you have an attorney fully versed in the requirements if you are thinking about pursing this route. Perkins loans operate very differently that most student loans. These loans are offered and administered by where you attended school. They also have a lot more loan forgiveness options than other loan types. Perkins loans have unique requirements for loan cancellation based on the field you work in. Schools award these Federal loans to high-need students attending or planning to attend college. Make sure you fill out the FAFSA each year and check your financial aid award to see if you qualify. Depending on the profession (see list below), Perkins loan borrowers can have up to 100% of their loan cancelled over the course of 5 years (except when indicated). 15% of their principal balance and accrued interest can be cancelled after their first and second year of qualifying service. 20% of their principal balance and accrued interest can be cancelled after their third and fourth year. 30% of their principal balance and accrued interest can be cancelled after their fifth year. Perkins loans also offer concurrent deferment if you are performing qualifying service. Combining that postponement with these cancellation options means you could potentially never have to make payments on these loans. That's a fantastic deal! The professions eligible for cancellation and the requirements are listed below. Active-Duty Imminent Danger Area: You must serve in the U.S. Armed Forces in a hostile fire or imminent danger area. You may receive forgiveness for up to 50% of your outstanding loans if your active duty ended before August 14, 2008. You may receive up to 100% forgiveness of your outstanding loans if your active duty includes or began after August 14, 2008. Attorney: You must be a full-time attorney employed in a Federal or community defender organization. You must perform qualified service that began on or after August 14, 2008. You may receive up to 100% student loan forgiveness. Child or Family Services Agency: You must be a full-time employee of a public or non-profit child or family services agency providing services to high-risk children and their families from low-income communities. You may receive up to 100% student loan forgiveness. Firefighter Or Law Enforcement: You must be a full-time firefighter, law enforcement officer, or corrections officer, whose service began on or after August 14, 2008. You may receive up to 100% student loan forgiveness. HeadStart: You must be a full-time staff member in the education component of a HeadStart program. You may receive up to 100% forgiveness of your loans, paid out as 15% of the principal balance and accrued interest for each year of service. Intervention Services Provider: You must be a full-time qualified professional provider of early intervention services for the disabled. Service must have begun on or after August 14, 2008. You may receive up to 100% student loan forgiveness. Librarian: You must be a librarian with a master’s degree working in a Title I-eligible elementary or secondary school or in a public library serving Title I-eligible schools (find the list of qualifying schools here). You must have been employed on or after August 14, 2008. You may receive up to 100% student loan forgiveness..
Nurse or Medical Technician: You must be a full-time nurse or medical technician. You may receive up to 100% student loan forgiveness. Check out our full guide to student loan forgiveness for nurses. Pre-kindergarten or Child Care: You must be a full-time staff member in a pre-kindergarten or child care program that is licensed or regulated by a state. You must have been employed on or after August 14, 2008. You may receive up to 100% student loan forgiveness. Speech Pathologist: You must be a full-time speech pathologist with a master’s degree working in a Title I-eligible elementary or secondary school. You may receive up to 100% student loan forgiveness. Teacher - Shortage Area: You must be a full-time teacher of math, science, foreign languages, bilingual education, or other fields designated as teacher shortage areas. You may receive up to 100% forgiveness of your loans. Teacher - Special Education: You must be a full-time special education teacher of children with disabilities in a public school, nonprofit elementary or secondary school, or educational service agency. If the service is at an educational service agency, it must include August 14, 2008, or have begun on or after that date. You may receive up to 100% student loan forgiveness. Tribal College Faculty: You must be a full-time faculty member at a tribal college or university. Your service must include August 14, 2008, or have begun on or after that date. You may receive up to 100% student loan forgiveness. Sadly, if you have private loans, there aren't any specific ways to get student loan forgiveness. Private student loans act much more like a car loan or mortgage - in that you pay your amount and don't have any special programs with your loan. There are potentially some options, and we break them down here: Help With Private Student Loan Debt. If you're looking for ways to lower your private student loan payment, you might consider student loan refinancing. You can potentially lower your interest rate or change your repayment length - both which could lower your monthly payment significantly (and maybe save you money). We recommend Credible to compare refinancing options. You can see if it makes sense to refinance in as little as 2 minutes. Plus, College Investor readers get a $200 bonus when they refinance with Credible. Check out Credible here. Give it a try here: Credible Refinancing Tool. The bottom line is that there are a lot of different student loan forgiveness options. 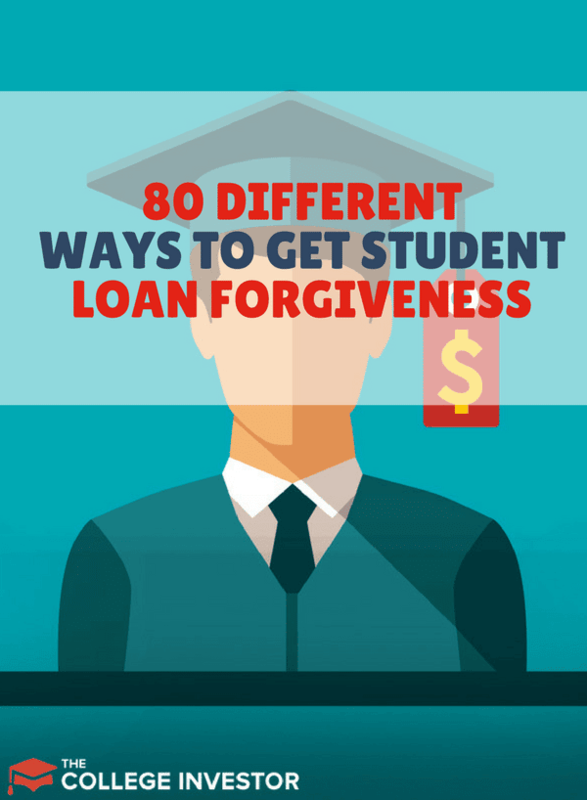 We've shown you over 80 different ways to get student loan forgiveness. It sounds like it could be confusing, but it doesn’t have to be. Remember, you can sign up for these programs for free at StudentLoans.gov. Let us know if you've taken advantage of any of these programs! We'd love to know how much you've saved. What help do you need? How much student loan debt do you have? What type? Did you sign up for our email course to get organized and figure out the best course of action? Last year I learned that I could apply to discharge my loans on the grounds of false certification (I did not have a HS diploma / GED, had a criminal record that was almost certain to bar me from employment in the fields I was studying for and have / had PTSD and ADHD which would’ve made it highly unlikely for me to successfully work in my chosen field. The school was aware of all this and certified me for the loan anyway. I requested an application for discharge from ECMC in January 2018 when I got a letter stating they were going to garnish my wages / take my tax refund checking the boxes for no high school diploma / GED and having conditions (mental and criminal) that would prevent me from working in the career I was training for. I never got anything back, but I got my full refund in April, so I was convinced it had been approved and never thought to follow up about why I wasn’t sent the applicantion for discharge. Now, a year later, my refund has been offset. I downloaded the applcation for discharge and am working on gathering supportive evidence (diagnosis dates, etc). Hopefully will be sending it all of within a week. Assuming I’m successful in getting the loan discharged, will I have any chance of getting the money they took from my taxes or can I kiss that goodbye? Will it automatically be returned or is there anything I specifically do to initiate getting that money back? Your return is gone towards the loans. You can get your loans discharged, which would be the remaining balance. Each of the 120 payments for PSLF are counted individually. So, you don’t lose eligibility, especially if you’re now making payments on your income driven payment plan. You may even have some past payments you’ve made that might qualify. I came out of lawschool in 2009 with $160k in student loan debt from a private Florida law school. Between myself, and family members I was able to pay the loans down to around 50-60k. I was diagnosed with ADHD years ago, and now find that as a Lawyer it obviously causes me substantial issues. I am unable to hold a normal attorney Job. I have started my own practice, but I really only make enough money to pay my staff and overhead. I was able to take less than 20k for the last 3 years of my practice. They have tanked my credit, I can’t get car loans, I have difficulty even securing living quarters. At this point I am seriously considering returning to work as a Mechanic, as that was my original profession, and I would be able to make more money doing that. However, I undertook these enormous loans on the promise that I would be able to earn money in the field, which it is looking like I really can not do. The loans have already capitalized back from 50k to 100k in just a few years. These loans are drowning me, they have ruined my credit and my life. Is this something I can discharge on the basis of disability? They are capitalizing at a rate substantially faster than I can pay them. Then, go for public service loan forgiveness to get your entire loan balance forgiven. Depending on the repayment plan your wife selected, they plan may require that your joint AGI be used to calculate the monthly payment on the loan. That’s just the law. It doesn’t make you responsible for the loan, but your income is used to calculate the income-driven repayment plan amount.